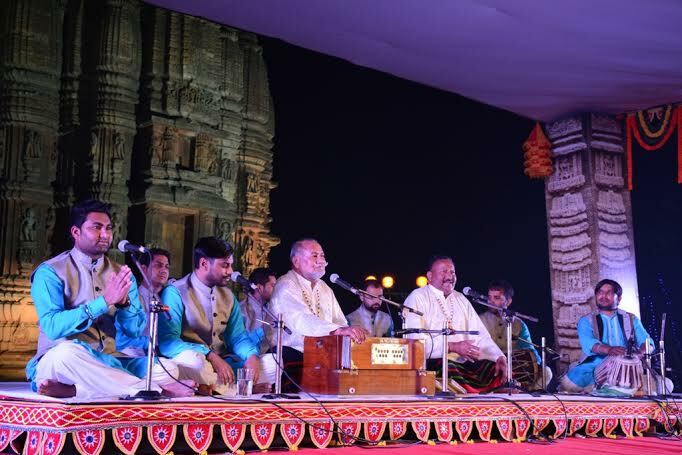 With the spring setting in, the 11th Century AD famous Rajarani Temple vibrates with the symphony of enchanting Indian classical music presented by the noted artistes of National and International repute. Department of Tourism organises this unique festival of classical music starting from 18th to 20th January 2016 on the lush green ambiance in the precinct of the magnificent Rajarani Temple. The evening’s first programme was Odissi Vocal recital in Raganga phase by eminent singer Smt. Mohapatra Minati Bhanja on the song Ja Ja Tu Pherija Nagari Raja written by Shri Lokanath Pattnaik set to Rag Ananda Vairabi and Tala Ektali. This was followed by Champu a typical Odissi song Ta Gheni Tamala Shyama written by Kavisurya Baladev Rath. Her next presentation was Natyangi Sakhigo Mora Kunjaku Aaja written by poet Banamali. She ended her programme with an Astapadi from Gitagovinda Kapi MAdhuripana Bilasiti Jubati Adhikaguna set to Rag Ragasri and Tala Ektali. She was accompanied in Mardala by Guru Jagannath Kuanra, on Violin Guru Shri Ramesh Chandra Das and on Harmonium Guru Himanshu Sekhar Swain. The different renditions of Odissi Music were indeed very melodious and emotive. Minati Bhanja mesmerized the audiences by her mellifluous voice which regaled the audience till the end of her programme. Second programme was Hindustani Vocal by Wadali Brothers (Puranchand Wadali and Pyarelal Wadali). Their first presentation was Rag Aabhogi followed by some Sufiyana songs. Their presentation was highly applauded for it was intellectually satisfying and emotionally appealing. The dignitaries who graced the inaugural function were Shri Ashok Chandra Panda, Hon’ble Minister, Tourism & Culture; Shri Bijaya Kumar Mohanty, Hon’ble MLA, Bhubaneswar Central; Shri Priyadarshi Mishra, Hon’ble MLA, Bhubaneswar North; Shri Ananta Narayan Jena, Hon’ble Mayor; Shri G. K. Dhal, Principal Secretary, Tourism and Shri N. B. Jawale, Director, Tourism. The programme was conducted by Smt. Sangita Gosain and Dr. Arshiya Sethi.